Please mark these dates in your calendar. Orchestra is a performance-based class, and participation in performances is required. ​See the course syllabus for grading details. TOP: Solid ​white shirt. Shoulders must be covered. Boys are encouraged to wear a golf shirt or button-down. Neckties are encouraged, but optional. BOTTOM: Black trousers or skirts (must be knee-length or longer). Avoid jeans if possible. SHOES: Avoid sneakers if possible.​ Dress shoes are encouraged. All other elements of the school dress code must be followed. ​How do weather delays and cancellations affect Orchestra at the Middle School? In the case of a 1-hour, 2-hour, or 3-hour delay, Middle School students will still have all their normal class periods. 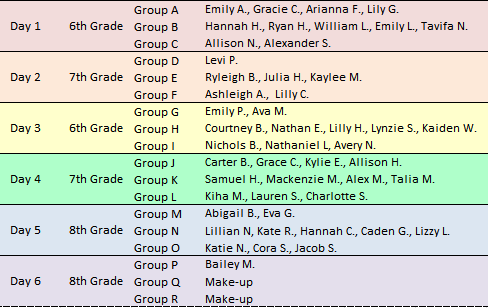 Orchestra students will be expected to attend Large-Group and Small-Group classes during their scheduled class period. The times of that class period will be shorter than normal and may be at an unusual time of day. In the case of a severe weather cancellation, the 6-day cycle will resume on the first day back to school. For example: if a snow-day occurs on a day 2, the first day back to school will be day 2. 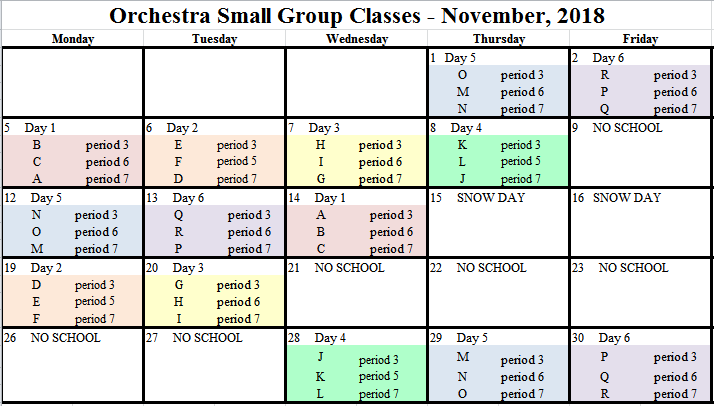 Orchestra students will be expected to attend Large-Group and Small-Group classes as normal according to the 6-day cycle.